The level of technical wizardry now being used in cars at all price brackets is astonishing, even compared to just a few years ago. But are cars as safe as they once were? And what can you do to make sure yours isn’t stolen or broken into and valuables stolen? Only a small percentage of cars on the road are ever stolen, but if it happens to you it can be fairly traumatic. It’s also an ongoing headache as you need to find a new car, claim on insurance for the loss and most probably have to pay higher premiums in future too. One of the most common acts of theft involves new car tyres. Thieves look for cars which have just had the tyres changed, or are new off the forecourt, and steal all the wheels. Locking wheel nuts need a special key to remove them, so are a great deterrent (just don’t leave the key in the glove compartment!). Don’t leave keys anywhere near the front door – if they’re fob-type keys thieves can use the latest technology to capture the signal and use it themselves. If you lose your keys act fast to get them cancelled, and re-programme any key for a car you buy if it’s had previous owners. Most cars have alarms fitted as standard, but you can get even better ones fitted if you require. Insurers sometimes give extra discounts for these. 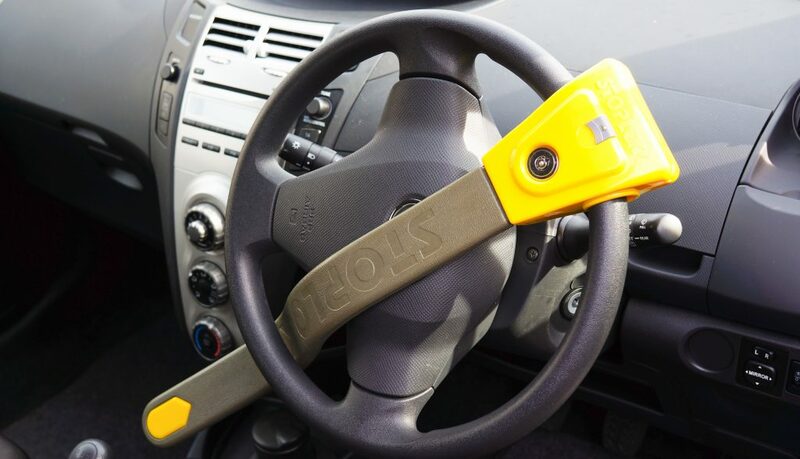 They might seem almost old-fashioned as they’re not really ‘hi-tech’, but a good old steering wheel, handbrake or gearstick lock really does put off thieves as they can clearly see they won’t be able to drive your car away without great trouble. As with alarms, insurers often offer discounts for those with a decent tracker fitted as it increases the chances greatly of a car being traced and recovered if stolen. If your car can’t be driven away, it can’t be stolen. Immobilisers are quickly fitted and work in a number of ways, usually by a clever device which stops the engine starting while it’s activated. If you park in a driveway that’s open to the road, or even directly outside your house on the street, a big CCTV camera pointing at your vehicle can certainly be another way of putting off criminals. Etching your registration number or vehicle identification number onto windows or headlights is a discreet way of increasing your car’s security, and one you don’t have to think about once done. Again, it deters thieves and allows for greater chance of tracing. Glass fitting companies will do it for you, or simply buy a DIY kit. As an online insurance broker, we help our customers to compare products and find a policy that’s right for them. Customer care is at the heart of everything we do and we have a dedicated customer service team on hand by phone, email, twitter and instant chat. For more information, you can call our experts on 0330 0600 600 or visit www.policyexpert.co.uk/contact for more ways to reach us.